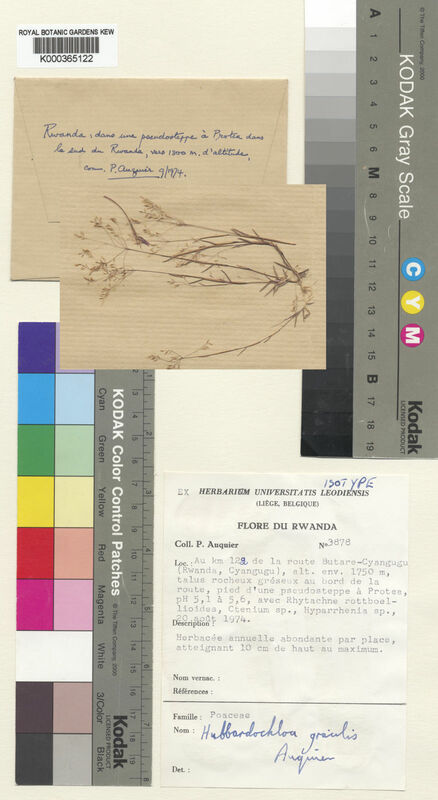 This genus is accepted, and its native range is Rwanda to Zambia. Inflorescence a delicate open panicle, the lower branches subverticillate. Spikelets 1-flowered, fusiform, disarticulating below the floret; glumes 1-nerved, thinly membranous, longer than the floret, persistent; lemma 1-nerved, hyaline, thinner than the glumes, entire at the apex and with a long flexuous terminal awn; palea absent. Caryopsis fusiform, the pericarp free. Annual. Culms erect, or decumbent; 4-17 cm long. Ligule a fringe of hairs. Inflorescence a panicle. Primary panicle branches whorled at lower nodes. Spikelets solitary. Fertile spikelets pedicelled. Spikelets comprising 1 fertile florets; without rhachilla extension. Spikelets lanceolate; laterally compressed; 1.2-1.4 mm long; breaking up at maturity; disarticulating below each fertile floret. Floret callus pubescent. Glumes persistent; exceeding apex of florets; firmer than fertile lemma. Lower glume oblong; 0.9-1 length of upper glume; membranous; without keels; 1 -veined. Lower glume lateral veins absent. Lower glume apex erose; obtuse. Upper glume lanceolate; membranous; 1-keeled; 1 -veined. Upper glume apex acute. Fertile lemma ovate; hyaline; without keel; 1 -veined. Lemma margins ciliate. Lemma apex truncate; awned. Principal lemma awn flexuous. Palea absent or minute. Lodicules absent. Anthers 3. Ovary glabrous. Caryopsis with adherent pericarp; fusiform; isodiametric; biconvex. Embryo 0.25 length of caryopsis. Hilum elliptic. in Bull. Jard. Bot. Belg. 50: 241 (1980).